Watch the Vegas Strip come alive for you as you cruise down the most iconic streets in the world. 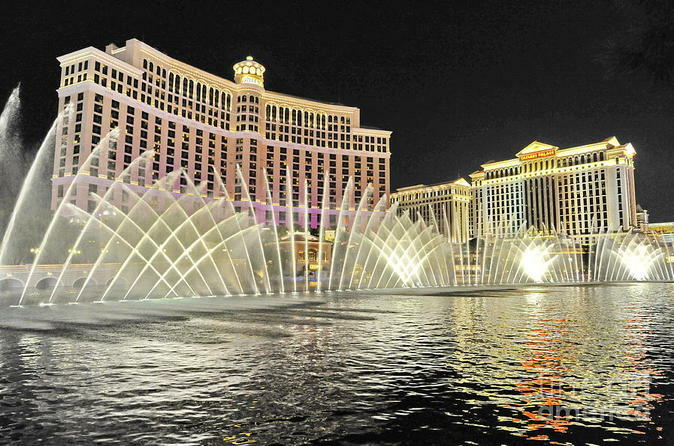 On this tour you will see the amazing water Fountains the Bellagio, watch the Volcano erupt at the Mirage ts take a stroll down memorable Fremont Street. Of course no tour is complete without a stop to the fabulous Welcome to Las Vegas sign. Take a slow cruise along the Las Vegas Strip on the way to watch the Mirage Volcano erupt into the nighttime sky. From there you'll travel to Fremont Street to see the fabulous old lights of Las Vegas. You'll also see the Fremont Street Experience overhead, doing their nightly show and wave to Vegas Vick our famous cowboy. Then head to the "Welcome to Las Vegas" sign, where your guide will help you get your pictures under the fabulous sign. From there you'll head back up the Strip to the Bellagio Fountains.